I hadn’t done a big costume since the 2009 Tauntaun and was anxious to do something big for 2012. I decided to do an AT-ST from Starwars. I’ve seen other people’s version of this costume online, but I felt there was room for improvement. 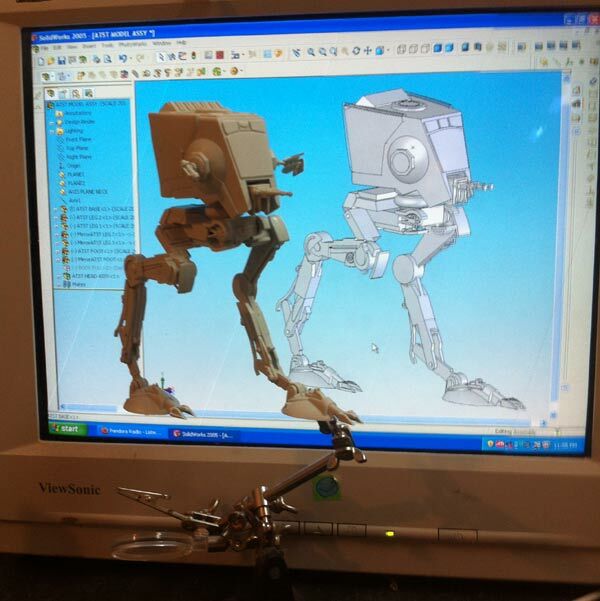 The first step was to model the AT-ST in 3d. I didn’t much feel like trying to duplicate the model from pictures, so I ordered a small Snap-tite plastic model from Ebay. A couple of days later, I had the 6” little model sitting on my desk. 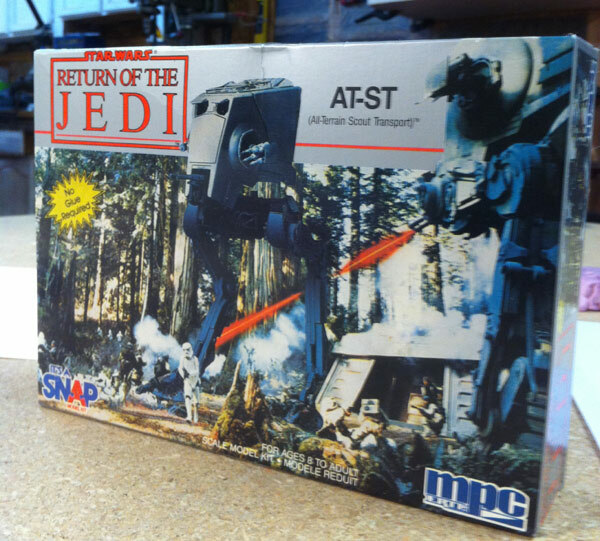 There were a few discrepancies between the model and the AT-ST from the films, but I doubted even hard-core fans would notice or care. Armed with my dial calipers and protractor, I began the tedious task of reverse engineering all the parts. In January of 2012, I started drawing the mockup model in Solidworks. I scaled the model by a factor of 20 to get my target size. 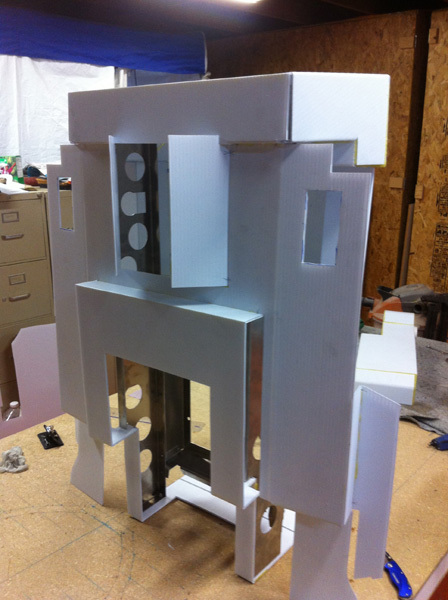 Along with a scale mockup of my body, drywall stilts and a backpack frame were modeled and inserted into the assembly. With all of the mockup components in one mockup assembly I was able to virtually move the costume to see how the legs would work. Once I was satisfied with the general design, it was time to get to the specifics. Each mockup component of the mockup assembly (Head, Body, Thigh, Leg, Foot) is copied/referenced and put into a new “Assembly” drawing. Multiple “working” parts are then created around the mockup component. Because I was using 4mm corrugated plastic (Coroplast ™) which can be bent, each new exterior part was drawn as if it was sheetmetal. After a part is created, with the click of a button, Solidworks unfolds the part into a flat pattern. After the parts are flattened in Solidworks, the flat pattern is imported into a sheetmetal CNC program. The sheetmetal CNC program generates machine code to run a giant punching machine that nibbles parts out of a sheet. Coroplast is rigid, but not enough to resist a 30 ton Turret Punch. 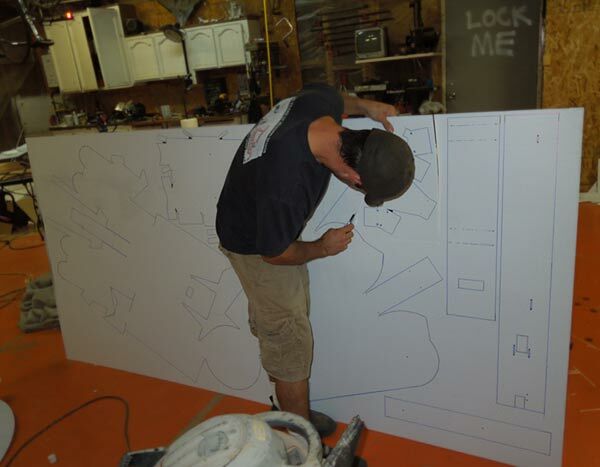 Instead of punching the coroplast, templates were punched out of 4’x8’ sheets of shower board from Home Depot. 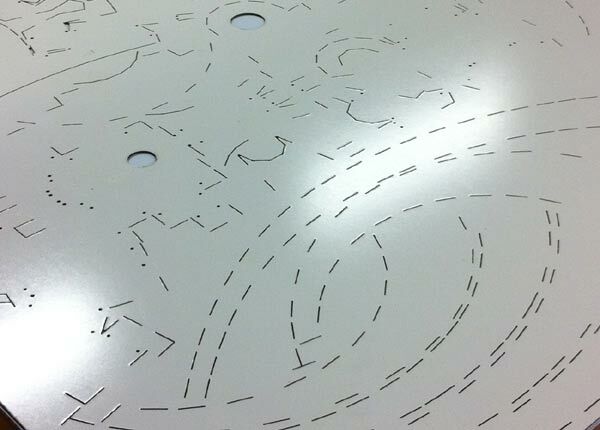 The punched templates were then laid over the top of a 4’x8’ sheet of coroplast. 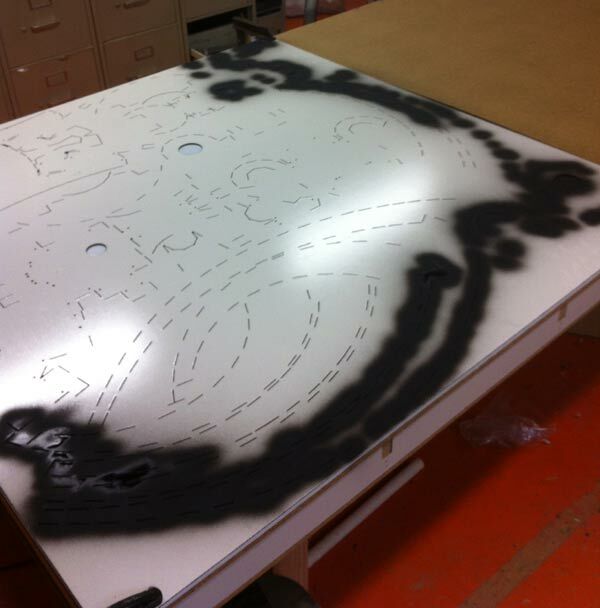 Flat spray paint was applied to the template, which transferred the cut lines to the Coroplast beneath. 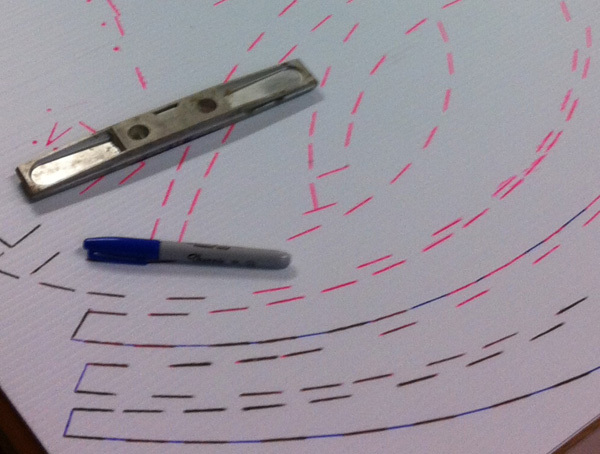 Using a Sharpie, proceed with the most tedious version of connect-the-dots to create the full outline of the parts. 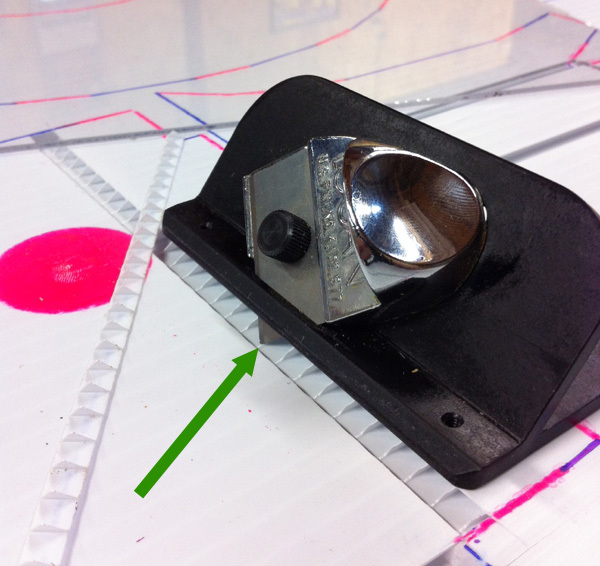 The profiles of the parts are cut using a utility knife, and the bend lines were miter cut using a hand-held mat cutter. 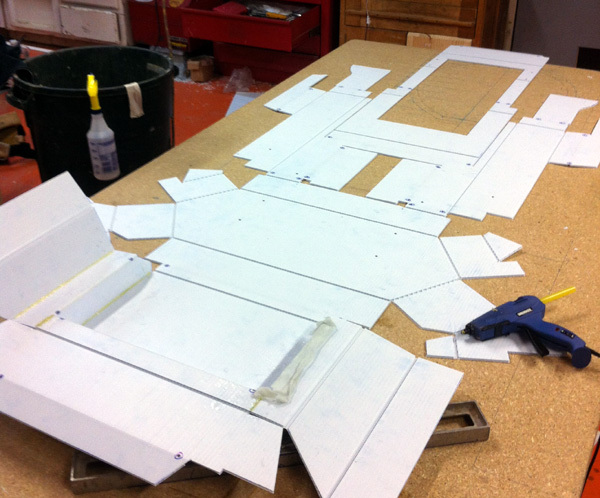 The profiles of the parts are cut using a utility knife, and the bend lines were miter cut using a hand-held mat cutter.